Artisan Jams, Jellies, Barbeque Sauces and more! Tipsy” Strawberry Jam – The fresh taste of summer strawberries with a generous splash of Grand Marnier. A staple in the McKechnie household since the 1800’s, it is perfect on toast, ice cream and waffles! Blueberry Mango Jam – This jam has a bold, slightly exotic taste that is just perfect on waffles or toast. Definitely one of our favourite combinations! 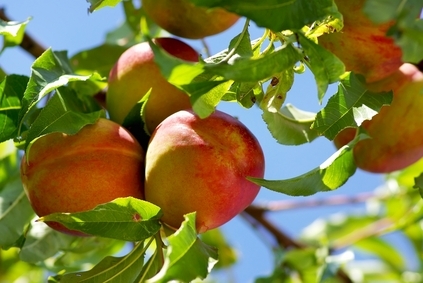 Summer Peach Jam – We use fresh Ontario peaches and whole vanilla beans to make this delightful jam. Gingered Pear Jam – We make this jam from organic Bartlett pears grown on our own trees. A hint of fresh ginger takes ordinary pear jam from good to seriously good! Roasted Garlic Jelly – Vampires Beware! Sweet and pungent roasted garlic makes it’s way into this jelly for a definite crowd pleaser. We use it to glaze roasted chicken and vegetables. It has also been served with crackers and blue cheese for very close friends! Wildfire – The name says it all! Made with nothing but habanero peppers, this jelly is sure to light a fire in your mouth! A truly versatile condiment, it is great with grilled fish, Caribbean style foods, salami, and cream cheese and crackers. Raspberry Jalapeno Jelly –The sweet, fresh taste of raspberries melds with the warmth of jalapeno peppers.A truly unique jelly for the adventurous! Try it as a baste for roasted pork or chicken, or as a glaze for grilled meats. It is also wonderful on a bagel with cheddar! Sticky Maple BBQ Sauce – We can barely keep up with the demand for this one! Pure Canadian Maple Syrup sweetens this classic tomato BBQ sauce. Best with chicken, ribs, and pork. Maple Whiskey BBQ Sauce – the most Canadian barbeque sauce you will ever try! Slightly spicy, smokey and tangy, this classic style barbecue sauce is just right on beef, chicken, pork and veggies. Jack Daniels BBQ Sauce – A big, bold grillin’ sauce with the kick of real Jack Daniels Tennessee Whiskey! Just baste your favourite steak or ribs, grill and savour! Brewhog – A Canadian twist on a classic Southern recipe. This tangy mustard-based barbecue is right at home on a pulled pork sandwich, pork sausages or any other slow-cooked meat! Spicy Mango Grilling Sauce – We’ve given this sweet, light BBQ sauce an extra dose of hot this year! Try it with grilled chicken wings, ribs, pork chops or fish. Pineapple Chutney – Sweet, aromatic and exotic, this chutney finds its way into appetizers, dinner and dessert. Delicious with baked brie, ham, pork and even crepes. We’re sure you’ll find the most surprising things to put it on! Cranberry Sage Chutney – This savoury chutney will replace the traditional cranberry sauce at your holiday dinner! Plenty of sage, ginger and dried fruit combine with fresh cranberries to create a deliciously tart and sweet condiment. Perfect for turkey, chicken and pork! Port Wine Jelly – try this savoury jelly with bread, cheese, pate, or roasted meats. Perfect for holiday entertaining! Mulled Wine Jelly – a warm, spiced jelly to pair with cooked meats, cheeses and charcuterie. 3 Pepper Hot Sauce – Our popular seasonal hot sauce! A fiery blend of locally sourced habanero, jalapeno and red serrano peppers, full of flavour and depth. Try it as a condiment for eggs, burgers, pasta or in a Caesar! Just bought your “Brewhog” bbq sauce on the weekend. Had a pool party yesterday and your sauce was a hit on the burgers. Thanks for the tasty sauces! We really like the raspberry jalapeno jelly, we eat it with crackers. Love this stuff. I always get mine at the Milton Farmers Market.